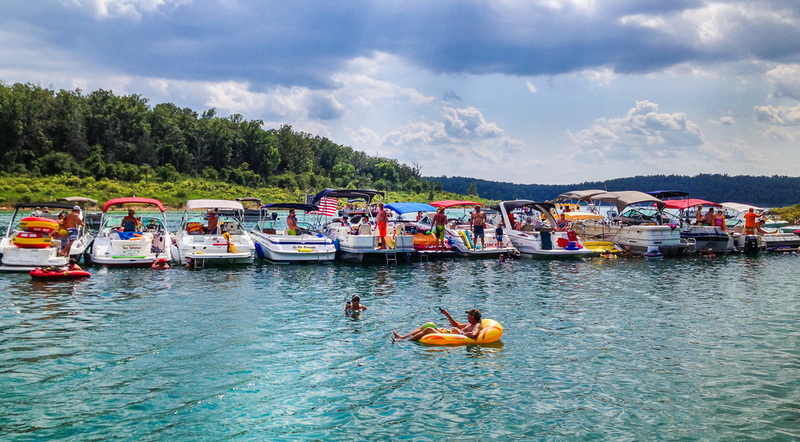 Pontiac Cove Marina on Bull Shoals Lake is a full-service marina, featuring 250 boat slips, boat rentals, fuel dock, scuba air station and fully stocked marina store. Professional fishing guide service is also available. 25' Landau Tritoon with 4-stroke 90 HP outboard motor. Cushioned seating with bimini top and tow bar (single rider tube included). 4-stroke 90 HP outboard motor. Cushioned seating with bimini top and tow bar (single rider tube included). OUR RENTAL POLICIES: A $100 deposit per day is required to reserve a boat; the balance is due in full 14 days prior to arrival and is non-refundable once paid in full. We only reserve boats for 8 hours at a time. Half-day rentals are available on a walk-in basis only. Fuel will be charged when the boat is returned. A cleaning fee may be charged if boats are returned dirty. We provide basic, orange collar life jackets for adults; please bring life jackets for kids 12 and under or anyone else who needs to wear a life jacket while aboard the boat. Adult ski vests are only provided for our tritoons for tubing. We do not allow pets on board our rental boats. No grills are allowed. You must be 25 or older to rent a boat. Anyone born after Jan. 1, 1984 is required to have a boater's license. Renters are responsible for knowing and adhering to this law before renting a boat. Boat type, size of motor and rates are subject to change. Cost for short-term overnight parking is $15 to $25 per night, depending on the size of your boat and the size of slips available. Check-out time is noon. To reserve a boat slip, please call 417-679-3676. Slips are payable in advance. Please see cancellation policy below. Cost for annual slips depends on the size of the boat and the size and location of the slip. All lifts are privately owned. Please call 417-679-3676 or email info@pontiaccove.com for more information on our annual slip rental rates and availability.